An Analogue surveillance camera is fitted with a CCD (charge-coupled device) sensor that digitises the light that falls on its surface capturing the image for processing. Before transmission of the video, the image has to be converted back to an analogue signal so that it can be viewed on video monitor or recorder. 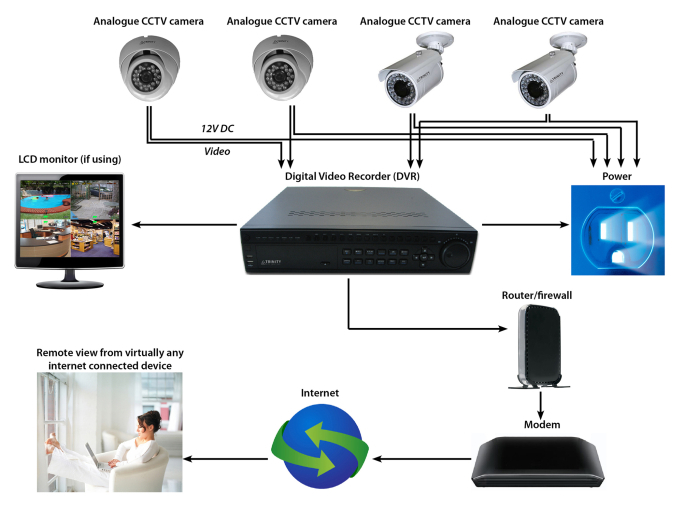 Analogue CCTV systems transmit video over coax or UTP (unshielded twisted pair) cabling to a digital video recorder (DVR). At this point the video is digitised and stored. Most modern DVRs have network capabilities giving the user the option to access the feed remotely from a local area network and with the proper configuration, from across a wide area network or over the internet. The benefit of a local area network set-up is that there are no videotapes to change; instead the video is stored on hard drives or a networked drive typically on a FIFO (first-on, first-off) basis so that there is always a rolling video archive over a user defined number of days. An HD (high definition) analogue camera is a special type of analogue CCTV security camera that can record surveillance video in 720/1080 high definition (HD). While previously only a feature available on newer IP cameras, these HD analogue cameras are ideal for surveillance systems that need HD quality for video evidence but may not need more the more advanced features of IP video. To incorporate new HD analogue cameras into an existing CCTV system, you will need an HD DVR capable of handling the HD video files. If you want to use your surveillance video as evidence of a crime, for facial recognition, to read number plates, or to help identify objects, high definition resolution is highly recommended. HD analogue cameras installed near entrances and exits at face height can help you capture clear video of everyone coming into your home or business, in case you need to identify an individual. HD resolution is also essential in capturing clear video of any crimes, attacks, vandalism, or other questionable behaviour because it allows you to see exactly what happened. As an affordable alternative to IP technology, HD analogue cameras grant you access to the newest technology in the surveillance world while staying on budget, an important factor for small businesses. HD analogue cameras come in a wide range of styles, making them easy to fit into any location. Choose from indoor and outdoor cameras, along with bullet and dome form factors. Why not speak to our CCTV team about Analogue CCTV solutions. Prefer to talk to someone? Give our expert sales team a call and they will be happy to answer any and all of your Analogue CCTV related questions.